I did not confirm if it was a bad batch I just assumed due to the test results. The other test are acurate as I have had no issue with Salifert test. The thread asks for Saltmix Parameters and that is what I posted. I recorded the test results and posted them on youtube. If there are inconsistencies in product people should be made aware as this is an expensive hobby. Last edited by Pablos RSM 450; 05/10/2016 at 11:15 PM. There can be bad batches. Just like there can be bad reagents for test kits. First post states this should be for those times where things are going well to get a general idea of what to expect from a particular salt brand. A bad batch is not something to expect on average. Heh. This statistics discussion had me looking at this thread of fantastic information and thinking to myself "really, what would be great is if we had averages, standard deviations, and lowest and highest reported values for each parameter of every salt mix." Then I realized this hobby is a little crazy sometimes, and the salt companies probably aren't paying you a consulting fee for doing the job of quality control. So, do you want parameters that are known to be off? I'm certainly not paid and have invested quite a bit in all the stuff I've been posting over the past year from test kit comparisons to this salt mix parameter thread. I do think high and low ball outliers are worth noting, but - like you - I think it's deceiving to average them into your overall average parameter values, when they don't reflect normal experience with the product. When you describe a set of data, if I only get to have one number - the average is the best one. If I get 4 numbers to characterize a set of data, then I'd want average, standard deviation, maximum and minimum. 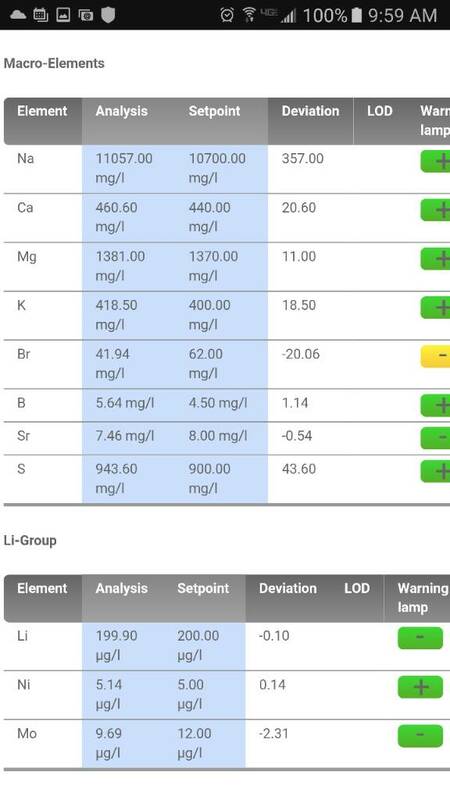 And your test kit showdown helped me make sense of stupid magnesium readings. I'm mostly following this thread for the oddball trace element/metals contents of various salt mixes. You're doing awesome stuff around here, really valuable info. I tested Instant Ocean Regular again today to be sure that the results I provided were accurate. I used a Marine Depot Refractometor PRO calibrated with Aqua Craft Refractometer Calibration Fluid from BRS @ 35ppt 1.026sg. The salt was purchased this week from Drs Foster and Smith with lot#16103. I purchase from large suppliers that keep their salt constantly moving compared to a private vendor on Amazon or Ebay that can have an old batch sitting for a while before being sold. I have purchased all of the salts I have tested from Drs Foster & Smith, Bulk Reef Supply, and Marine Depot. If there is a way of verifying a bad Instant Ocean batch please let me know. I have known people to contact IO and send them samples of the salt for them to test. They have also sent back replacment salt when the original tested bad. Then this is also what this thread is partly about. Getting a good general consensus of around what to expect for any particular salt brand. If your tests deviate greatly then there may be one of several reasons. 2. Salt bag/box not used in its entirety and has different parameters depending on where a sample is taken from. Mixing the bag/box as best as possible before use. But to also keep in mind small deviations will occur from batch to batch and test to test. Last edited by jason2459; 05/12/2016 at 12:48 PM. Thanks for the advice. I contacted them and was given a case number with a request to send 2-4 cups of the salt. That's great. Please post an update when they respond back with the results. This is not the probiotic version. 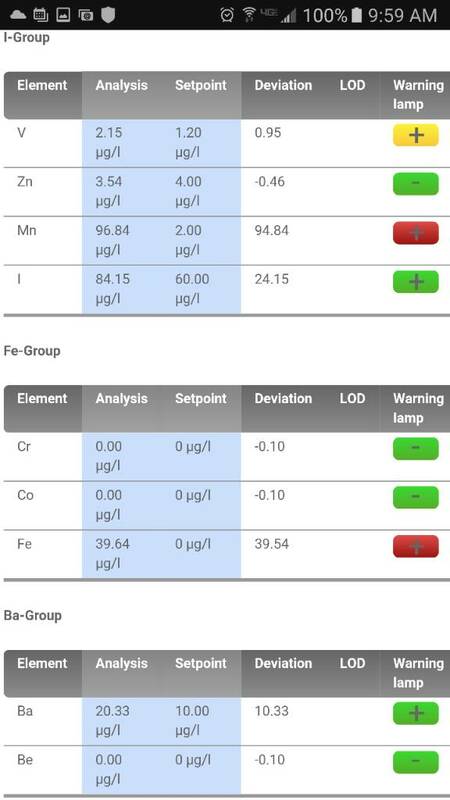 I looked at their parameters as posted by aquaforest and looked pretty similar between the main 3 Alk, Ca, and Mg. Triton and I are not going to be able to test for those organics and figured its not worth the time or money to test both versons. 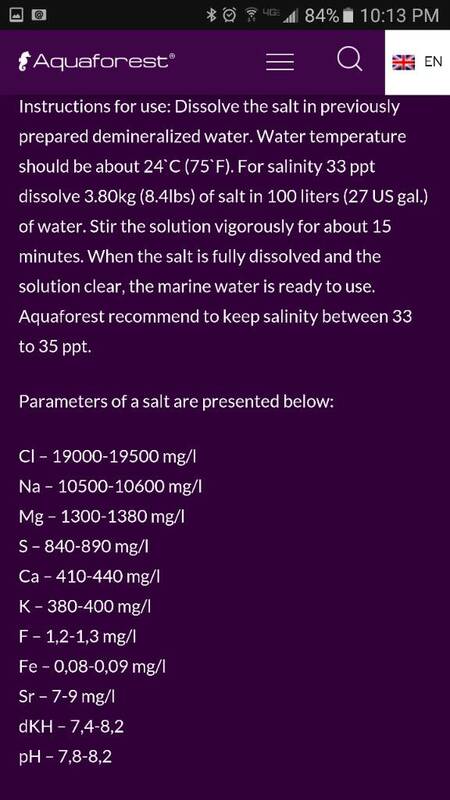 I did get the basic marine salt and will so that one next. Looks like you need to read between some lines for aquaforest. The parameters listed and QC tested look to be for 33ppt. Also, just noticed the bucket says Low Bromide and their site description says no bromide. Will find out soon enough with in Triton's LOD. 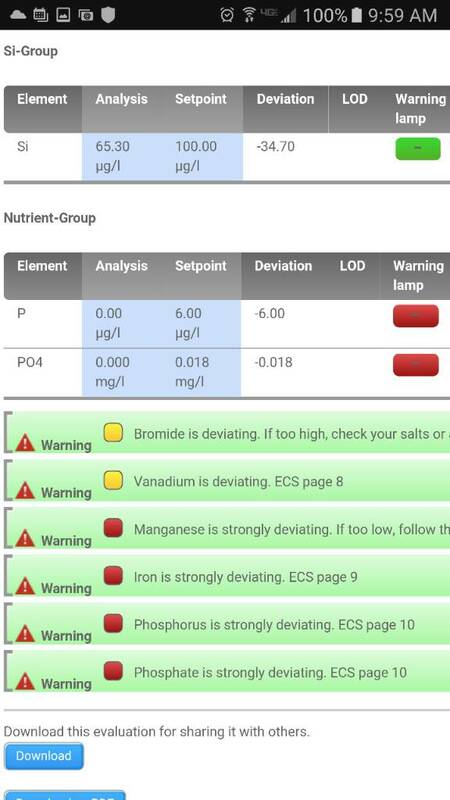 Pablos, I tested my IO salt mix also from a 200 gallon box I received about 2 months ago and my results were very similar to yours. Only difference was my calc was around 340 and my mag was 1050. Those results turned me away from IO and I have been looking for a new salt mix when I use up the last bit I have left. 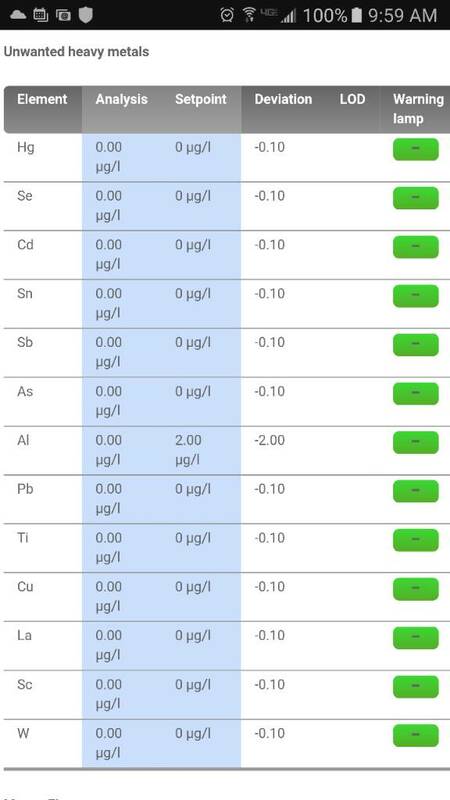 Morning Jason, the following Triton ICP lab test results are from a sample of Aquaforest Probiotic salt that I had tested last year. As in a previous post, the sample was taken from a mix consisting of 15L of DI water at 0.6ppm TDS and 630g of salt, which gave 52.8mS. I wasn’t comfortable using the salt after seeing these results. It will be interesting to see if your results follow a similar pattern. Holy cow look at that aluminum. Thanks for providing that. You cannot store any of the af salt once mixed. So if you're doing daily awc's it won't be a good choice. I tried it briefly but noticed a horrible brown residue in my mixing tank and went right back to ESV. Calculating that out Salinity comes to around 32.63ppt. I'm still surprised at that amount of aluminum. Intersting the probiotic QC was listed at 35ppt. 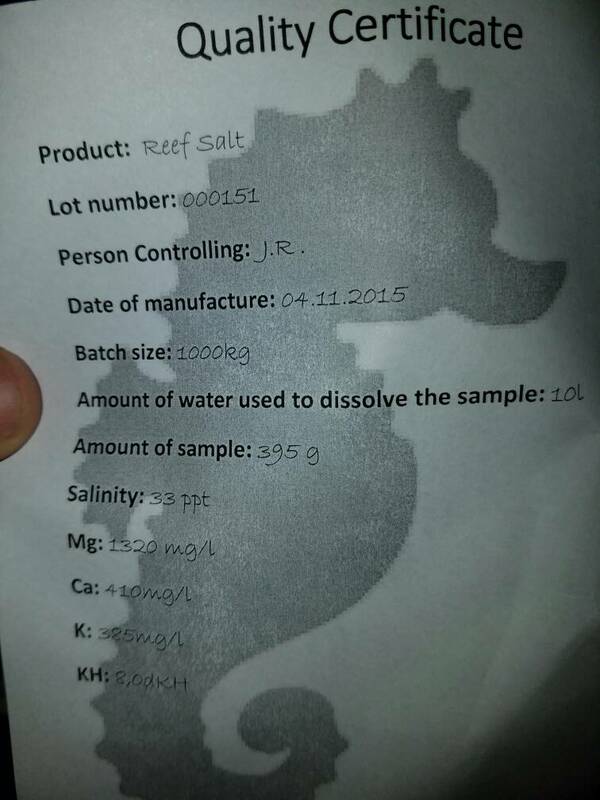 The reef salt QC was list as 33ppt. Was that the probiotic type? I would definitely try to use that right away. I don't see that they add organics to the marine or reef types. That may be clay..........similar to what happens with IO. It leaves a slight brown residue when you use the same container over time. With IO it's harmless..............my mixing container can is caked with it from years of use. If I remember right, the clay residue is from a bonding agent. One thing I have always done with IO is mix for 24 hours before testing and use. My readings always seem to be more on the mark.........closer to NSW..... than what some people post. I have tested a bunch of different salts. Red Sea Coral Pro, Tropic Marin Pro Reef, HW Marine Reefer, Seachem Reef Salt, Instant Ocean Reef Crystals, Instant Ocean Regular, and Coralife. Hello Jason. I am confident that the conductivity reading of 52.8mS was accurate. The device used to take the measurement was a Myron Ultrameter II 4P, which has been calibrated against traceable standards. I can’t explain why all of the major elements in the results are lower than natural sea water values though. Looks like that first missing sample of Tropic Marine Pro reappeared and made its way to Triton. 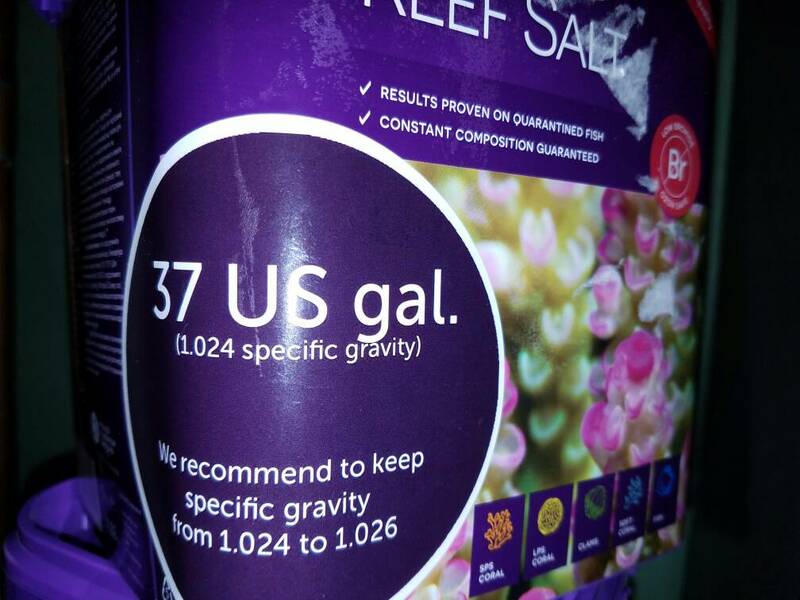 Do you would recommend Coralife over Reef Crystals and Instant Ocean regular? I'm almost done with my bucket of RC and have been thinking of switching salts, I used Coralife back in the late 90's and was very happy with it. Thinking about switching back. Yes I would. I am definitely happy with the result from Coralife. I recently tested another bag from the 200 gal box of Instant Ocean. I got 10.75 dKH, 420 Cal, 1080 Mg. once I get done with my last box of HW Marine Reefer I will stay with Coralife. HW is really good but also expensive. Best deal I have found is on Drs.Foster & Smith. Triton has had some technical problems the past couple weeks related to updating their website and interfaces. So, they are discarding any samples they have that weren't tested that are 2 weeks old. 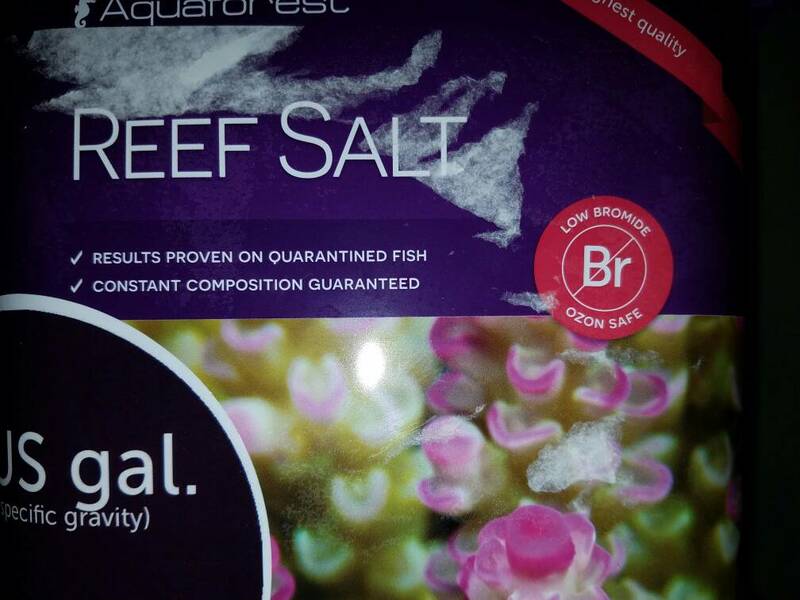 I'll have to redo the Aquaforest Reef Salt again. They are sending new vials to people. I have all three versions of the aquaforest salt to test now too.